She always wanted to see Paris. Juliet never made it to Paris. She died of cancer in February of 1996 at the age of 33. Good memories of her, funny memories of her, live on with her friends, her family, and her former students. 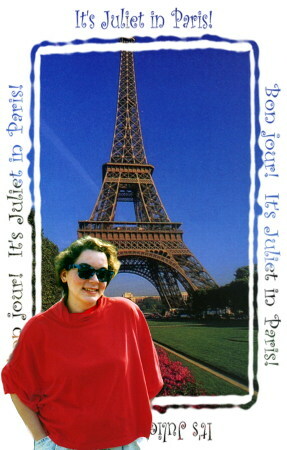 To remember and celebrate her life, let's meet Juliet on her own terms — as if she would have ever given us another choice — and let's meet her in Paris! This site is divided into five main areas, as shown in the menu bar below. To start, simply click on one of the five images.